Speech-Language Pathologists, Physical Therapists, and Occupational Therapists are available to you Monday through Friday. 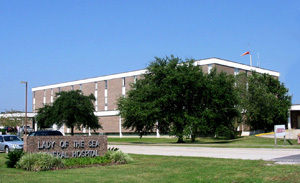 Located by Lady of the Sea General Hospital. If you think you could benefit from any of our therapy services, ask your doctor or call us and talk to one of our therapists. Astym®(A-stim) – Treatment sets of the standard soft tissue therapy by regeneration of healthy soft tissue(muscles, tendons, etc,), and removes unwanted scar tissue that may cause pain or movement restrictions with the use of specialized instruments. Lymphedema Treatment - To reduce edema with the use of Manual Lymphatic Drainage, Bandaging and Compression, Skin care and Hygiene, Exercise and Self-Massage. Vital Stimulation - Uses neuromuscular electrical stimulation to muscles involved in swallowing to facilitate strengthening for safe swallowing. Vestibular Rehabilitation - Focuses on treating patients with Benign Paroxysmal Vertigo (BPPV). Pelvic Floor Dysfunction - Male and female treatment of urinary incontinence, pelvic pain, pregnancy and postpartum musculoskeletal conditions. Med Surgery Acute Rehabilitation - Provides a variety of therapy services to patients during their stay in the hospital. Skilled Swing Bed - Services for patients in need of short-term rehabilitation therapies following a hospital stay after an illness or surgery. Multidisciplinary approach with focus on return home at the same physical level as prior to hospital stay. More aggressive PT, OT, and ST intervention. Small gym for exercises.